There are so many causes to PS4 media player not playing, not streaming movies, thus we orgnize the guide into 3 parts and offer solutions correspondingly. 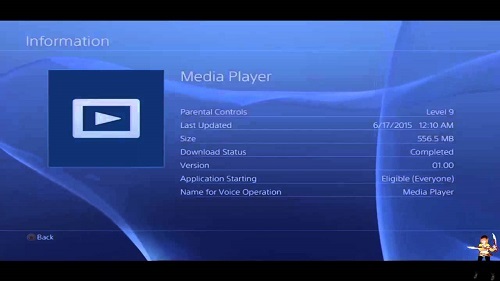 PlayStation 4 Media Player Best Workaround - 5KPlayer! PS4 Media Player not streaming movies? Get 5KPlayer for an emergency! This PS4 media player alternent rescues you from all possible PS 4 video player issues instantly! It supports almost all V/A formats and codec including MP4 H.265 VP8/VP9, MKV, AAC, MP3, FLAC. High-res 8bit 4K 8K videos can also be read smoothly. Get it now! Indeed, MP4/AVI/MKV video formats are supported by PS4 media player, but why can't we play them still? Possible reason 1: Missing folder. To view or play files from media player PS4 USB stick or external harddrive, video and image files must be saved within a folder on your storage device. Music files in particular must be saved within a folder titled "MUSIC". Possible reason 2: DLNA server access permission. Your DLNA server has access protection. If your video file is saved in DLNA server, make sure to adjust your DLNA media server settings to grant your PlayStation 4 system access. The corresponding Error Message would be: "Cannot access this media server." Possible reason 3: File limitation. Though PS4 media player do supports MP4/AVI/MKV/MP3 no matter in USB or DLNA media server, they have strict codec/size limitations - jump to PS4 media player strictly supported formats. Convert the media file first to make it playable on PS4 device. The corresponding Playstation 4 Media Player Error Message to this not playing issue would be: "There is no playable media" & "Cannot play audio. The audio format is not supported." & "Cannot play the media." How to Watch Free Movies on ps4 from video sites? PS4 movie streaming from online sites like Twitch/YouTube might bring you into connection failure. How to solve that problem? 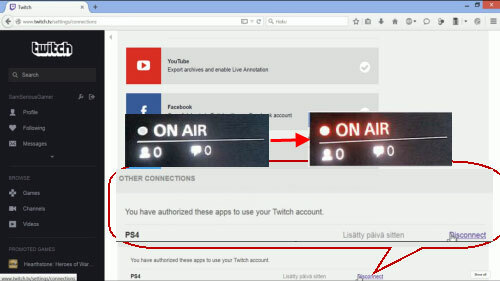 Take Twitch as a example: When you get the Grey On Air / Live logo and Ps4 stream says Processing on its left top corner, you should check out the connections from Twitch online website: Go to Setting > Connections > Find PS4 under "Other Connections" > Click to enable it! To watch free movies on PS4 locally, you may have to convert the incompatible file formats into supported formats in advance. If you are using a PlayStation 4 Pro, you can also use PlayStation 4 Media Player to play 4K videos in MP4 saved on a USB stick/home server, as well as 4K VR content when using PlayStation VR. And since PS4 Pro does not have a 4K Bluray driver, high-res bluray DVD movies cannot be played by PS4 media player, only 1080p bluray. Supported channel number: Only 2ch. Note: Make sure that the picture is smaller than 40 Megapixels or 30MB in size. Using PlayStation 4 Pro watching movie videos has so many limitations and compatibility issues. To quickily solve the PS4 media player not working trouble/PS4 not streaming movies and resume smooth playback in no time, we suggest you pick the reliable 5KPlayer. This media player plays back almost all file formats including incomplete files in its row form, 4K 3D bluray videos. It employs AirPlay tech to free mirror movie/DVD videos to Apple TV from Windows & Mac to realize movie watching on TV. Besides, it downloads online movies/music from YouTube to MP3 or to iPhone/Android compatible formats.